Ringgold Light Artillery of Reading, Logan Guard of Lewiston, Washington Artillery of Pottsville, National Light Infantry of Pottsville, and Allen Rifles of Allentown tendered services April 13, 1861. Moved to Harrisburg April 16-17. Mustered in April 18, and moved to Washington, D.C., via Baltimore. Md., April 18. Quartered in the Capitol, guard Arsenal and Navy Yard. Logan Guard and Washington Artillery on duty at Fort Washington. Assigned to 25th Pennsylvania as Companies "A," "D," "E," "G" and "H". The people of Pennsylvania, reluctant to believe that the political leaders of the South intended to inaugurate civil war, were gradually led, by the formal secession of several of the Southern States, to think that such an event was possible. The subsequent vigorous and imposing preparations made by the military forces of South Carolina, under the leadership of General Beauregard, to besiege and capture a starving garrison of sixty effective men, under Major Anderson, at Fort Sumter, had finally prepared the public mind for an attack, which promised so safe and successful a result to the besiegers. On the morning of the 12th of April, 1861, the Executive of Pennsylvania received a telegram in these words: "The war is commenced. The batteries began firing at four o'clock this morning. Major Anderson replied, and a brisk cannonading commenced. This is reliable and has just come to the Associated Press. The vessels were not in sight. "* This startling intelligence, flashed along the lines of telegraph, across the Alleghenies, was soon heard in the remote corners of the Commonwealth. Threatnings and defiance, from Southern leaders, had long since ceased to intimidate; but when they fired upon the Flag, its import could not be mistaken. It meant war, and the appeal to arms was at once accepted by the masses of the North, however much they deprecated the alternative. Three days later, on the 15th of April, the President of the United States issued his proclamation calling out the militia of the several States to the number of seventy-five thousand men. On the afternoon of the same day, the Secretary of War telegraphed to the Executive, that a call had been made on Pennsylvania for sixteen regiments. Two regiments were wanted within three days. A sudden dash upon the Capital was already strongly threatened. The city was entirely unprotected, and at the mercy of the assailants. The President's call, accompanied by an appeal from the Executive, was telegraphed to every part of the Commonwealth, urging men to come forward, in companies and squads, with all possible dispatch, to the defence of the imperiled Capital. Aside from the city of Philadelphia, there were few militia companies fully armed and equipped; and of these, few contained even, the minimum number of (32) men. As the intelligence, of the appeal for men, spread through the towns and villages of the interior, the officers of the few organized companies, hastily called their men together, and tendered their services to the Governor. Allen Rifles, CaptainYeager, of Allentown. Early in January, 1861, the late Major General William H. Keim, with characteristic sagacity, had advised Captain M'Knight that the services of his company would probably soon be needed, and had counseled him to hold them in readiness for immediate service. Hence, from that time forward, frequent and almost daily drills were practiced. The dispatch, announcing the attack on Fort Sumter, found the company at drill at some distance from the city. The effect was electrical. All were impatient to move to the defence of the Flag. The Logan Guards, of Lewistown, could muster but twenty-six members; but, on receipt of a telegram from Governor Curtin, dated April 16, accepting their services, and urging them to lose no time in moving, the drum-call was soon heard along the streets, and in less than an hour, one hundred and six men, including the twenty-six original members, were in line and ready to march. At ten o'clock P. M., of the same day, the company moved to the station on the opposite bank of the Juniata river; but, owing to a lack of transportation, it did not reach Harrisburg till the morning of the 17th. The officers of the National Light Infantry, of Pottsville had, as early as the 11th of April, by a resolution of the company, tendered its services to the Secretary of War, and were notified, on the 13th, of their acceptance. The Washington Artillery, also of Pottsville, with like patriotic ardor, anticipating the wants of the government, had, on the 13th of April, tendered their services to, and been accepted by the Government. The two companies, under marching orders, left Pottsville on the 17th, and arrived in Harrisburg, at eight o'clock in the evening. Simultaneously with these, came, also, the Allen Guard from Allentown, a company efficiently organized and well drilled, under Captain Yeager. On the morning of the 18th of April, a detachment of Regulars of company "H," 4th Artillery, consisting of some forty or fifty men, arrived in Harrisburg from the West, in command of Lieutenant Pemberton, afterward a Lieutenant General of the rebel army, and chief in the fruitless defence of' Vicksburg. The five volunteer companies having been mustered into the service of the United States by Captain Seneca G. Simmons, of the 7th Infantry, the regulars and these volunteers, departed on the same train, at nine o'clock A. M., of the 18th,the former for Fort M'Henry, near Baltimore, the latter for Washington, and arrived at Baltimore at one P. M. The volunteers were under the necessity of marching some two miles through the city, from Bolton to Camden station. On leaving the cars, a battalion was formed in the following order: Pemberton, with his regulars, on the right; Selheimer, with the Logan Guards, next; and Yeager, Wren and M'Donald following, M'Knight, with the Ringgold Artillery, bringing up the rear. As the column was forming near Bolton station, the police of Baltimore appeared in large force, headed by Marshal Kane, and followed by a mob, who at once commenced an attack upon the volunteers, countenanced by a portion of the police, sent to give safe conduct through the city. Orders were given to the men to preserve their temper, and to make no reply to anything that should be said to them. At the command "forward," the mob commenced hooting, jeering, and yelling, and proclaimed with oaths, that the troops should not pass through their city to fight the South. Arriving near the centre of the city, Pemberton, with his regulars, filed off towards Fort M'Henry, leaving the volunteers to pursue their way through the city as best they could. At this juncture the mob were excited to a perfect frenzy, breaking the line of the police, and pushing through the files of men, in an attempt to break the column. Every insult, that could be heaped upon the troops, was offered, but no word of reply was elicited, the officers and men marching steadily on towards Camden station. At every step the mob increased, until it numbered thousands of the most determined and desperate rebels of the war. The Logan Guards were armed with thirty-four Springfield muskets, which had been drawn from the National armory, on a requisition from the Adjutant General of Pennsylvania, at the time of its organization in 1858, and thirty-four of their number carrying them, were uniformed precisely like the regulars. The officers and some of the men wore revolvers at their sides, well loaded. Aside from these, there was not a charge of powder in the five companies; but one of the men of the Logan Guards, happening to have a box of percussion caps in his pocket, had previously distributed them to his comrades, and the thirty four muskets of the Guards were capped, and carried, half cocked, at a support arms, creating the impression in the mob, that these muskets were loaded, and would be used against them, if they attempted an assault. This feint was believed to have saved that little band of volunteers from the bloody and brutal attack which awaited the Massachusetts 6th on the following day. As the volunteers were boarding the train at the station, the angry mob hurled a shower of bricks, clubs, and stones into their disorganized ranks, fortunately, however, inflicting only slight injuries. In the midst of the confusion, an attempt was made to detach the engine from the train and run it away. This was only prevented by the determined character of the engineer and his assistants, who drew revolvers, and threatened to shoot any who dared to make the attempt. At length, amidst the demoniac yells of the crowd, the train moved off, carrying the volunteers safely beyond the reach of their desperate assailants. In the meantime, great solicitude was felt by the State officials at Harrisburg, for the safety of these unarmed and defenceless men, pioneers, pushing forward, amidst threatening and discordant elements, to the rescue of an imperiled and helpless government. The previous, demonstrations of the disorderly element in Baltimore had created alarm, and solicitude was felt, lest an attack should be made upon the volunteers, and they would need arms-and ammunition for their own defence; but so great was the demand for men, and so loud the call from Washington to hasten their march, that the necessary equipments, which were not in hand, could not be procured. Upon the arrival of the volunteers at Baltimore, the Governor and his executive and staff officers, repaired to the telegraph office in Harrisburg, and awaited, in almost breathless anxiety, for the first intelligence of these pioneer soldiers. When, at length, the announcement was made of their successful march through the city, and of the safe departure of the train bearing them on to Washington, he raised his arm, and pledged in his own characteristic manner, that not another Pennsylvania soldier should leave the State unarmed, if the capital should be razed to the ground. At seven o'clock P. M., of the 18th,** these five companies, the head of the grand column of two millions of men, who were afterwards mustered and marched in their footprints, arrived in Washington. Major (since Major General) Irwin M'Dowell assumed command, and ordered them to quarters in the Capitol. Arms, ammunition, and equipments were furnished, and the work was immediately commenced of barricading the Capitol, fronting the Potomac with barrels of cement, and large sheets of boiler iron. The timely arrival of these troops was the occasion of much joy. On the opposite side of the Potomac, on the Virginia shore, squads of rebel soldiers were drilling in full view of the Capitol, and, but for this accession of strength, the city might have fallen an easy prey. 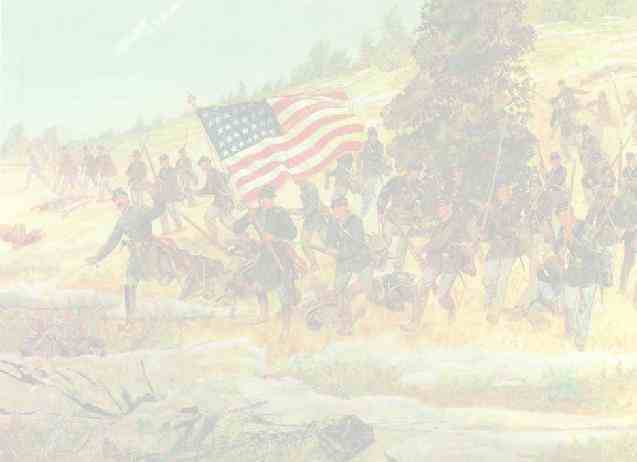 The night of the 18th passed quietly away, and at day-break of the 19th, the morning report of the Logan Guards, officially signed, was handed, by the First Sergeant of the company, to Adjutant General Thomas, that officer remarking, that it was the first official volunteer report received. On Tuesday, the 23d, it was ascertained that an attempt would be made to capture Washington by way of the Arsenal and the Navy Yard. The Ringgold Artillerists were, accordingly, ordered to report to Captain (since Admiral) Dahlgren, at the Navy Yard. Three twelve-pound howitzers were assigned to the company, with which to defend the place. With the exception of a detachment of twelve men, detailed to guard the Short bridge, the entire command was required to man these guns. On the 25th, a Sergeant and six men were detailed from the company to serve as guard on the Steamer Powhatan, dispatched to make a reconnoissance -down the Potomac, to search for obstructions, and to ascertain if forts were being erected along the river. On Friday, the 26th of April, the company was ordered, by Major W. M'Dowell, to duty at the Capitol. Remaining there till, the 15th of May, it was ordered to report for duty to Major (since Major -General) Ramsey, at the Washington Arsenal, who assigned it to quarters in the penitentiary. When the company left Harrisburg, on the 18th of April, it was ordered to leave behind its field pieces, and equipments, with the exception of sabres. This order was exceedingly distasteful to the men, as their guns, which they kept beautifully burnished, and designated by pet names, had come to be regarded with an attachment which only soldiers know. On the 16th of May, to the great joy of the men, their pieces were restored to them, and there ordered to discontinue all other duty, to put their guns and caissons in proper condition, and to -commence, at once, gun and sabre drill. On the 18th the company was inspected by the Secretary of War, Mr. Cameron. With the exception of a short interval, when detailed to mount guns in the forts about Washington, the company remained on duty at the Arsenal till the expiration of its term of service, never having performed duty with the regiment to which it was nominally attached. The Logan Guards and Washington Artillery, after remaining in the Capitol some ten days, were ordered to garrison duty at Fort Washington, then in command of Brevet Major J. A. Haskins, of the Regular army, These two companies having an excess of men, a new company was formed from the surplus, and First Lieutenant David A. Smith, of the Washington Artillery, was commissioned Captain thereof. These pioneer companies, which had promptly marched to the Capital on the first alarm, and had been assigned to duty for its safety and protection, amidst the great uprising of the people which ensued, seem to have been lost sight of, and forgotten by the State authorities. For, not until two hundred and forty other companies, that succeeded them in the service, had been organized into regiments, brigades and divisions, were they remembered as a part of Pennsylvania troops. After twenty-four other regiments were organized and fully equipped, these first companies, which were justly entitled to the first place in the 1st regiment, were organized as a part of the 25th and last regiment for the three months' service. Henry L. Cake, of Pottsville was elected Colonel, and Captain Selheimer, of the Logan Guards, Lieutenant Colonel. Colonel Selheimer was ordered to join the regiment; but the companies serving in Fort Washington never saw the regiment or its Colonel; indeed, only knew that they belonged to a regiment from the fact that one of their Captains had been transferred by promotion. Nearly two months, of the three for which they had enlisted, had passed, before these companies received adequate clothing or camp equipage, from either the State or National Government, and many of the men were excused from duty because of their partial nakedness. Major Haskins, and the efficient officers under him at the Fort, worked zealously and kindly with these troops, in perfecting them in their duties as soldiers, and so well did they succeed, that in the single company of Logan Guards, one-half of the number became commissioned officers in various Pennsylvania regiments, four of the number being Brevet Brigadier Generals, four Colonels, four Lieutenant Colonels, six Majors, eighteen Captains, and thirty-two Lieutenants. Among the privates in the ranks of this company, in their march through Baltimore, was Brigadier General Wim. H. Irwin, who commanded a brigade of General Franklin's corps at Antietam; Brevet Brigadier General Wm. G. Mitchell, chief of General Hancock's staff; Brevet Brigadier General J. A. Mathews, who commanded the second brigade of General Hartranft's division, in the 9th corps; and Brigadier General Thomas M. Hulings, who was killed while gallantly leading his regiment into the thickest of the Wilderness fight. That the thanks of this House are due, and are hereby tendered to the five hundred and thirty soldiers from Pennsylvania, who passed through the mob of Baltimore, and reached Washington on the eighteenth of April last, for the defence of the National Capital. * Telegram, addressed to Gov. Curtin, from Philadelphia, by J. Morris Harding. **The Massachusetts 6th arrived at the Capital at nine o'clock P. M., of April 19, and the New York 7th, which was the next to arrive, April 25. Source: Bates, Samuel P. History of the Pennsylvania Volunteers, 1861-65. Thompson, Heber Samuel, President, First Defenders' Association. The First Defenders, 1910.